CANCUN — A mob of angry Mexicans attacked a Russian man in Cancun with sticks and rocks over his repeated insults against locals, and the 42-year-old man was accused of fatally stabbing a youth in the melee, authorities said. Reuters reported that police rescued the Russian, identified as Aleksei Makeev, after the crowd stormed his apartment on Friday night May 19, said Guillermo Brahms, secretary general of Benito Juarez municipality, which encompasses Cancun. The incident began when a group of people confronted Makeev over his disparaging comments toward locals, many of which he videotaped and posted online. Makeev stabbed a youth who got into his apartment, prompting the mob to grow and the violence to escalate, Brahms said. The youth later died of his injuries. Makeev, who was taken to hospital for treatment, is being held there under protective custody, the official said. Authorities said Makeev made videos of himself insulting people in public places in Russian, English and Spanish. In some, he spoke against a backdrop of swastikas. 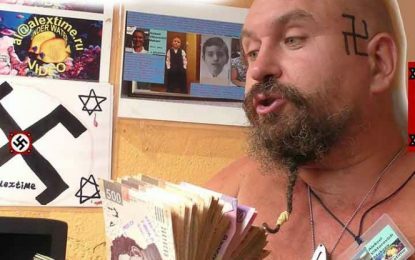 It was not clear how long Makeev had been in Mexico, but Aquaworld, a company offering maritime tours in Cancun, said in a statement on Facebook the Russian had been dismissed from its payroll in November 2015 because of his aggressive behavior. Mexico’s National Migration Institute said in separate statement that multiple complaints had been filed against Makeev because of his behavior and that it was seeking the cooperation of Russian authorities to deport him. The Russian embassy had no immediate comment.